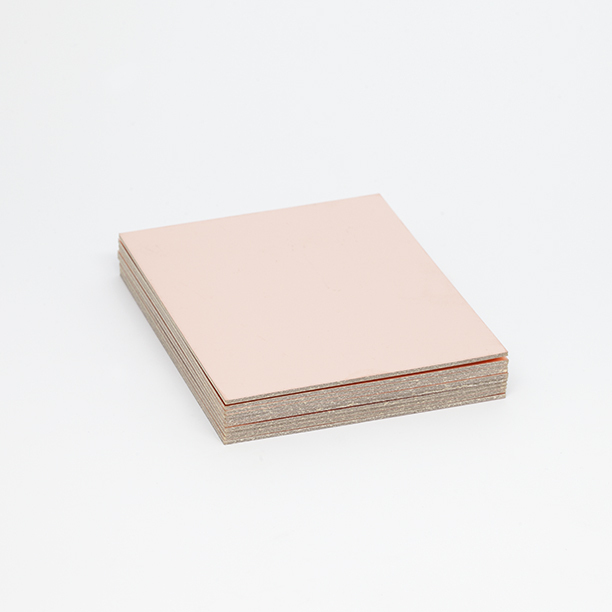 FR-1 is a hard, flat material that consists of a thin layer of copper over a non-conductive phenolic resin. It’s usually about the thickness of two or three credit cards. What is FR-1 used for? FR-1 is primarily used for making circuit boards. The thin copper layer can be milled or etched away, leaving traces to which electronic components can be soldered. Unlike FR-4, which is fiberglass-based and generates dangerous glass-shard dust when milled, FR-1 is safe to use if you keep it away from your eyes, lungs, and skin. We recommend vacuuming up the debris after you’re done milling (never blow on it). Where can I get FR-1? We sell it in our store. It’s generally hard to find in small quantities elsewhere. What’s the best way to fixture FR-1 to the bed of my Bantam Tools™ Desktop PCB Milling Machine? Attaching your board to the milling machine bed is called fixturing. The easiest way is with tape. Place strips of double-sided tape across the back of the board until most or all of it is covered with a single, even layer of tape, without any overlap or wrinkling. We recommend High-Strength Double-Sided Tape. Scotch Permanent Double-Sided Tape will also work in some applications, but Nitto tape is typically the better choice because it holds the FR-1 board more securely to the bed. 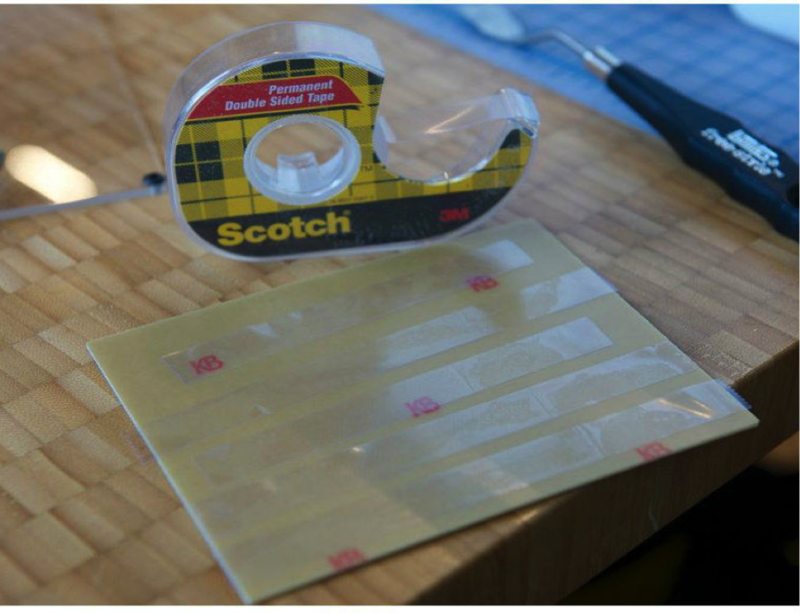 Sometimes Scotch tape allows the board to slightly move during the milling job, and this slight movement can contribute to problems, including rough cuts and dulled or broken end mills. Before you’ve applied tape to the FR-1 board, we recommend measuring the thickness of your board with digital calipers. Enter this value in the Material Thickness (z) field. Then use digital calipers to measure the thickness of the tape, and enter this value in the Material Placement (z) field. This will prevent the cutting tool from accidentally cutting too deep, which can damage the end mill and create rough cuts. It’s also good to store the FR-1 Blanks on a flat surface to prevent them from bowing. Before using a board, check if the board is bowed, also referred to as warped. You can check for bowing by placing the board on a flat surface and pressing on the left side then right side and see if it is flat, or see-sawing on the flat surface. If it is warped, you can try to gently bend it back the other way until it looks straight. This will help make sure the board lies flat, which is very important when using smaller end mills and milling small features. What end mills should I use when milling FR-1? Most circuit boards can be milled with either a 0.005” PCB Engraving Bit or a 0.003” PCB Engraving Bit to isolate the traces and pads, and a 1/32" Flat End Mill to cut the holes and board outline. Sometimes you might need to use a 1/64" Flat End Mill. Less commonly a 1/16" or 1/8" Flat End Mill can be used if you need to remove large sections of copper. Typically, to mill small features it's best to use a PCB Engraving Bit instead of a 1/100" Flat End Mill, because the Engraving Bits have a smaller cutting diameter and are more robust. Check out our Surface-Mount Package Compatibility Guide for more info on how to determine if a particular package can be milled with our milling machine. What is an example project? The Bantam Tools PCB Badge Project is a great way to learn how to work with FR-1. Note: These feeds and speeds are used by default in the software, and are provided here as a reference. Warning: These settings are for advanced users. Before using any of the information provided here, you must read the section above on fixturing your material. The feeds and speeds specified here are more aggressive (and thus faster), and improperly fixtured material can be knocked loose and damage itself and your machine. FR-1 needs to be completely flat, or else 1/64" and 1/100" end mills will break when they encounter part of the material that is sticking up. BitBreaker Mode must be enabled in order to change your feeds and speeds. If you experience any issues with feeds & speeds for FR-1 PCB Blanks, you can download the stock feeds & speeds in a custom tool library here.